Work life balance is one of those over used phrases in today’s busy world, and probably something you won’t really think about too much until yours falls out of kilter and you need to sit down and take stock. With a recession in full swing and most of us having to work for a living – and harder than we perhaps used to, to keep the roof over our head, there’s a temptation to pour all your energy into working, and forget why you are working in the first place. It’s all in the work life balance – if you spend too much time working, in the office or on the road, you could find you miss out on a family life...but then when you’re preoccupied with personal issues - marital problems, or issues with the kids, you can find that concentrating on your work is nigh on impossible too. Thankfully, a decent work life balance isn’t hard to achieve with a little thought. It’s a fact of life that the way we work has changed beyond all recognition in recent years. IT was supposed to make our lives easier but mobile phones, e-mail and instant messaging mean that we are always contactable – and it can be hard to escape from work even when you’re not there! You need to establish family time, if you are going to get a healthy work life balance. Don’t take the job home, however tempting that is. 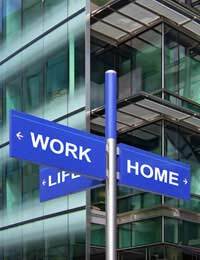 Create a boundary between work and home and also make a conscious decision to set aside family and friends time. And time for you, too! If you have a separate work mobile, turn it off at home, and don’t check e-mails when you are off duty. They can wait. You don’t have to work all the hours in order to be a good employee. Most good employers are very aware of issues around stress, family commitments and work life balance. Often the people who work the longest hours tend to be less productive than their colleagues. If you are feeling overwhelmed and need to slow down, talk to someone. Take advantage of flexi-time and don’t build up excess hours and not use them. Some employers offer flexible working hours, options such as a compressed working week, job-sharing or working from home. It’s worth exploring the options if you feel stressed out by the demands of work and home. You don’t have to say yes to everything. If you’re too busy already, decline a new project or client – it’s far better to be honest than pretend you can handle it and end up so stressed that everything goes badly. Work life balance doesn’t magically fall into place, you have to plan. Get yourself organised to do the little dull things around the house that take up your time – or better still sort a rota so that everyone does it. Draw up a family to-do list and calendar so everyone knows where everybody else is – and what they have to do! But remember that housework isn’t the be-all and end all. An untidy bedroom won’t kill anyone, and it might even be worth hiring a cleaner if you’re really stretched for time. Don’t get stressed – make sure you plan a little time just to do things you enjoy every day. Whether you like to get to the gym, watch TV or read a book, it’s vital that you focus on yourself too. Work life balance isn’t just about what you can do for your boss and your family! Should I Stay at Home With the Kids?